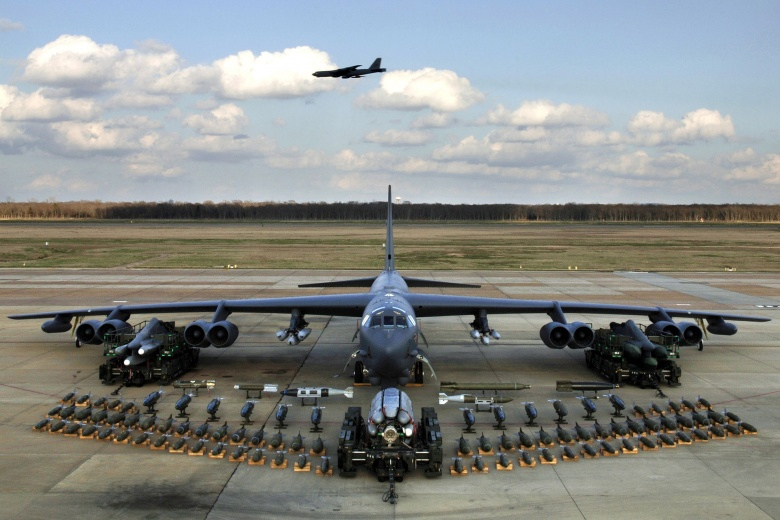 The US maintains a fleet of heavy long-range B-52 bombers like this one that carry nuclear-armed Cruise missiles and B61 nuclear gravity bombs, among many others, and which regularly fly “exercises” near North Korea. “Far from making remarks of any persuasive power that can be viewed to be helpful to defusing tension, he made unprecedented rude nonsense one has never heard from any of his predecessors,” the North’s President Kim Jong-un said after Trump’s UN bomb threat. Of course the imbecility of Trump’s speech is almost always rude nonsense, but his White House predecessors have been nearly as bloodthirsty in their overt threats against North Korea. While Trump certainly speaks like a mentally deranged dotard, his threat to totally destroy a country of 25 million people is only as deranged as those made by earlier presidents. George Bush continued the routine, hatefully naming North Korea part of an “axis of evil” during his 2002 State of the Union speech. Bush’s choice of the word “axis” usefully conjured images of Hitler Fascism, against which any atrocity can of course be excused. Likewise, Barack Obama calmly threatened the North during his April 2014 visit to Seoul, saying, “We will not hesitate to use our military might to defend our allies and our way of life.” Calling the North “a pariah state that would rather starve its people than feed their hopes and dreams,” Obama hearkened back to the country’s terrible 1996-1998 famine — “one of the great famines of the 20th Century” according to UN aid agencies. Obama conveniently neglected to recall much less apologise for any US responsibility in failing to provide adequate emergency food aid to the starving. Nowadays, Trump gets rightfully condemned for making threats of mass destruction against the tiny, underdeveloped North, especially as he sits at the head of the grandest military empire in the history of the world, with 12 ballistic missile submarines, 19 aircraft carrier battle groups, 450 land-based intercontinental ballistic missiles, almost 800 military bases in 70 countries and territories abroad, and shooting wars underway in seven different countries. Yet jittery trepidation regarding phantom threats by North Korea is routinely, almost universally voiced — even if it’s just as routinely debunked. In 1996, the editors at the New York Times warned, “North Korea could threaten parts of Hawaii and Alaska” in less 10 years. (“Star Wars, the Sequel” May 14) Now 22 years on, the North still can’t do it. In 2000, the same editors said US intelligence agencies “predict that North Korea could have the capacity to launch a handful of nuclear-tipped long-range missiles within five years.” (“Prelude to a Missile Defense,” Dec. 19) Eighteen years later, it still can’t. Fearmongering about North Korea always lacks any evidence that its ruling regime is suicidal, because there is no such evidence. Never explained by our military-industrial-Congressional weapons merchants, newspaper and TV pundits, or think tank analysts is why the North would precipitate its inevitable self-destruction by attacking the United States or its allies, because it never would. In view of the just-announced joint US/South Korean military invasion rehearsals known as “exercises” now set for April, North Korea is the place for legitimate trepidation. 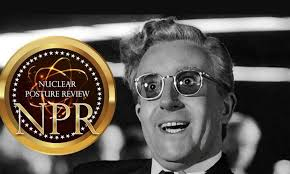 In keeping with the Trump Administration’s Feb. 2nd Nuclear Posture Review, Trump’s just-released Fiscal Year 2019 federal budget proposal dramatically ramps-up nuclear weapons research and production. The National Nuclear Security Administration (NNSA), the Department of Energy’s semi-autonomous nuclear weapons agency, is receiving a $2.2 billion overall boost to $15.1 billion, a 17 percent increase above FY 2018. Of that, a full $12.8 billion is for nuclear weapons — 8 percent above FY 2018. The NNSA’s “Directed [nuclear weapons] Stockpile Work” is increased 41 percent, from $3.3 billion to $4.7 billion. 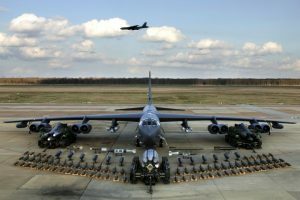 The “stockpile” programs are the hands-on, nut-and-bolts operations that include extending the operational service time of today’s nuclear weapons for up to 60 years, while also endowing them with new military capabilities. In addition, the NNSA budget shows the addition of another $1.76 billion to “Nuclear Weapons Activities,” for a grand total FY 2019 budget of $12.78 billion. The document doesn’t make clear where the additional money comes from. In the past it’s been drawn from Pentagon, but elsewhere in Trump’s budget there is a cut of over $17 billion from the anti-poverty Supplemental Nutrition Assistance Program, which ought to cover the NNSA. Of course, these figures cover just one fiscal year. Enormous as they are, they’re merely down-payments that only open the door on a proposed 30-year nuclear weapons “rebuild.” The $1.74 trillion “upgrade” includes $313 billion for a new fleet of missile-launching submarines; $13 billion for a “smart” hydrogen bomb the United States has never built before; $50 billion for a so-called “interoperable” nuclear warheads intended for use on either submarines, rockets, or missiles; $127 billion for a new heavy, long-range bomber dubbed the “China bomber” (to improve relations with our No. 1 trading partner); $30 billion for a new nuclear-armed Cruise missile; $149 billion for 600 new land-based missiles; and another $261 billion to rebuilt the Y-12 bomb plant in Tennessee, the Los Alamos Lab in New Mexico, and the (already finished) Kansas City bomb plant in Missouri. 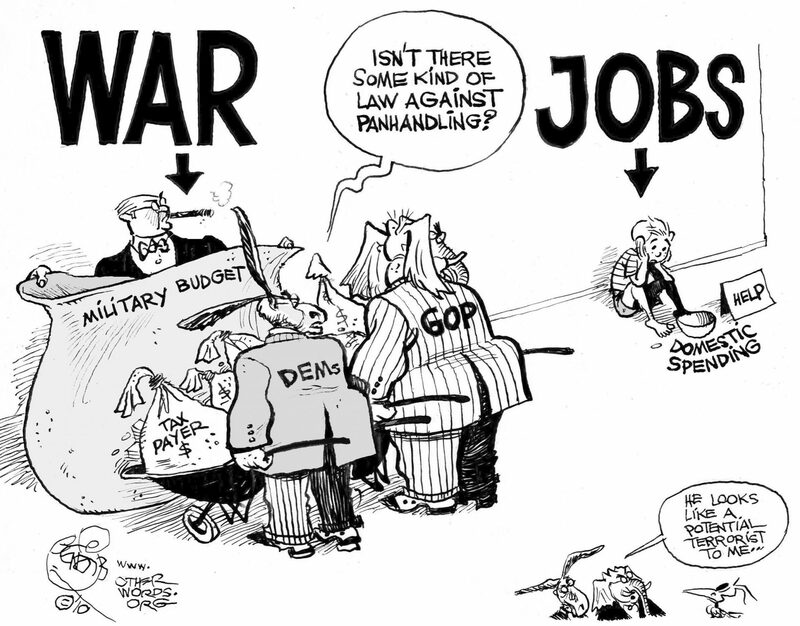 Trump’s plan also calls for a 13 percent increase in over all military spending (about $80 billion), raising Pentagon allotment to $686 billion. Can you say “national bankruptcy”? In a show of fiscal responsibility, some of the increases in weapons and war planning programs are being offset by deep cuts to the social safety net, education and healthcare programs. Although Mr. Trump’s political base of undereducated white supremacists are the biggest user of food stamps in the country, his budget slashes the Department of Education by over 10 percent, and bars Food Stamp recipients from buying fresh food and vegetables, “providing only a box food delivery program,” Democracy Now! reported. Trump’s budget also phases out federal funding for the Corporation for Public Broadcasting which supports public and community radio and TV stations, also known as Educational TV. With cuts to health, education and nutrition programs, you’d think the Self-proclaimed “genius” was trying to dumb down the electorate. Counting Carriers, or, When is an F-35B not an aircraft? In the post-fact US Navy, the USS America, left, with up to 2,930 personnel and a compliment of 20 F-35B fighter jets, is not an aircraft carrier. The Pentagon likes to say it has 10 aircraft carriers, the 10 Nimitz-class “super carriers” that displace 100,000 tons, and carry up to 6,000 people. But it actually has nineteen. The 19 carriers are not for deterrence or defense, considering Russia, China, Brazil, India, France and Thailand each have exactly one. Italy and Spain have two each, but they’re NATO allies. Not counted by the Pentagon are its Tarawa-class carriers with 2,800 people onboard. Three football fields long, and 20 stories high, the Tarawa ships “have the general profile of an aircraft carrier,” as the website GlobalSecurity.org notes. They carry 35 fighter aircraft, including Harrier fighter jets, Harrier jump jets, helicopters, reconnaissance aircraft and thousands of tons of langing vehicles for invasions. The eight other giant carriers are 45,000-ton Wasp-class behemoths, known instead as “amphibious assault ships” that the Navy calls “the largest amphibious ships in the world.” They launch helicopters, jump jets, hovercraft, landing craft and assault vehicles, and carry up to 2000 Marines. Used for waging war “forward…from the sea,” and “assault by air,” each of the eight Wasps have a 600-bed hospital. 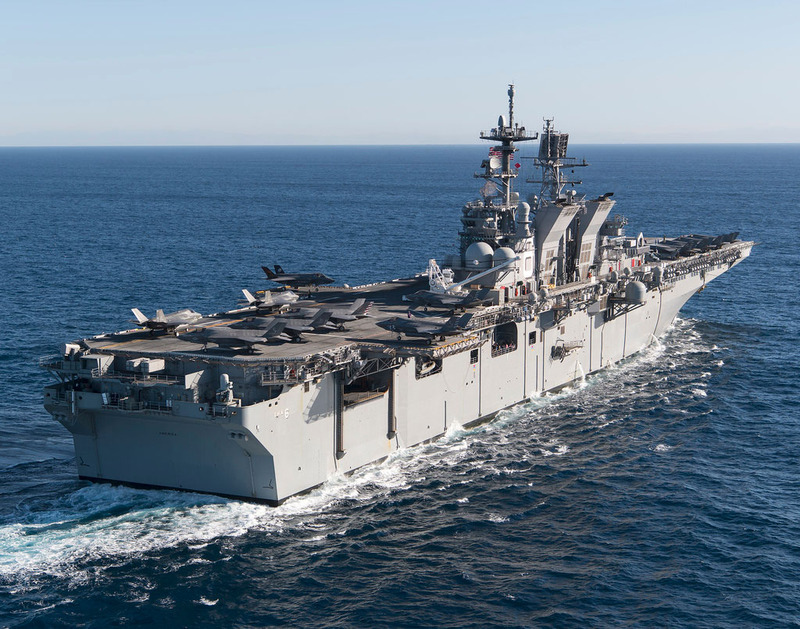 Two of the newest carriers—the $3.5 billion USS America and USS Tripoli—are “considerably larger than recent aircraft-carrying ships constructed for the Korean, Japanese, and Australian navies,” according to Robert Farley of the University of Kentucky’s Patterson School. 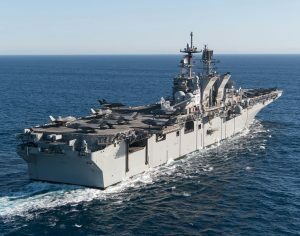 The America-class will carry up to 20 Marine Corps F-35B fighter jets, plus Osprey tilt-rotor aircraft, and helicopter gunships. Not satisfied with a 19-to-one advantage, the Navy is sea testing the biggest carrier on Earth, the Gerald R. Ford, a 100,000-ton, $10 billion giant that has a crew of 4,300 and carries a fleet of 90 aircraft. The number of Minuteman missiles has been cut in half since 1988, when Nukewatch published Nuclear Heartland, our groundbreaking atlas of the missiles’ locations. 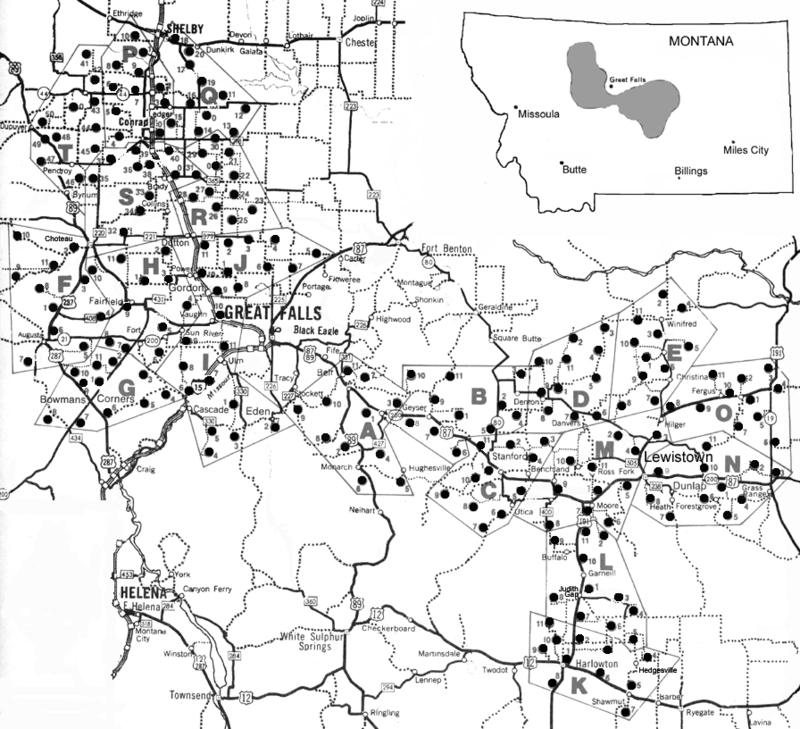 At the time, the Air Force was operating six giant missile fields: two in North Dakota, and one each in Missouri, South Dakota, Montana and Wyoming/Colorado/Nebraska. Three of these missile fields have now been decommissioned and eliminated: Missouri, South Dakota and Grand Forks, ND. Interestingly, these three areas were the most active with political and nonviolent direct action protesting nuclear weapons and the suicidal nuclear war policies that persist to this day. In South Dakota, adjacent to the Ellsworth Air Force Base, horse rancher Marv Kammerer kept a permanent vigil against nuclear madness. Marv’s ranch was a hub of Black Hills anti-nuclear activism during the ‘80s. He placed a giant peace sign made of painted stones on his land at one end of the air force runway so the bomber pilots wouldn’t ever miss it. In Missouri, the Silo Pruning Hooks plowshares action in 1984 brought attention to the first-strike Minuteman missiles, especially after four activists ¯ Carl and Paul Kabat, Helen Woodson and Larry Cloud Morgan ¯ received 8-to-12 years, the longest prison sentences for civil disobedience in U.S. history. Later, Nukewatch sponsored educational peace camps and participated in the Missouri Peace Planters actions that also resulted in serious prison sentences. In Grand Forks, North Dakota, the Bemidji, Minnesota Friends for a Nonviolent World organized annual Martin Luther King birthday protests (beginning before it was a holiday), as well as Hiroshima and Nagasaki Day actions, and a 150-mile Walk for Peace from Bemidji to the Grand Forks Air Force base ¯ a walk conducted six years in a row. Of the 10,000 warheads still deployed and stored in the U.S. nuclear arsenal, 2,346, about 24 percent, are now on 14 Trident submarines. Eight Tridents are on the East Coast at Kings Bay, Georgia, and six are on the West Coast at Bangor, Washington. 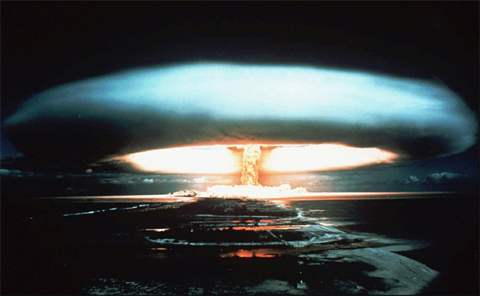 The U.S. is alone in placing its nuclear weapons in other countries; between 400 and 480 U.S. warheads are deployed at U.S. bases in England, Holland, Germany, Italy, Belgium and Turkey. 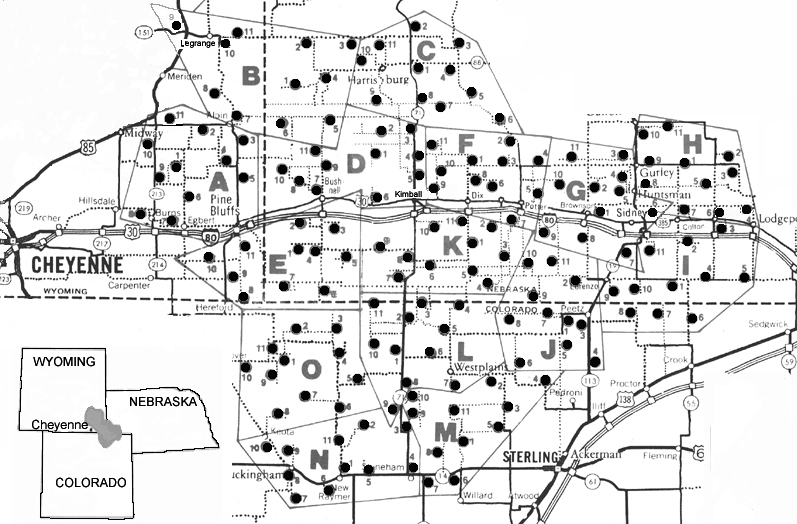 Each dot in the maps above and below pinpoints the location of one Minuteman missile. Nukewatch spent three years — 1985 through 1988 — locating the landbased missile silos of the United States. 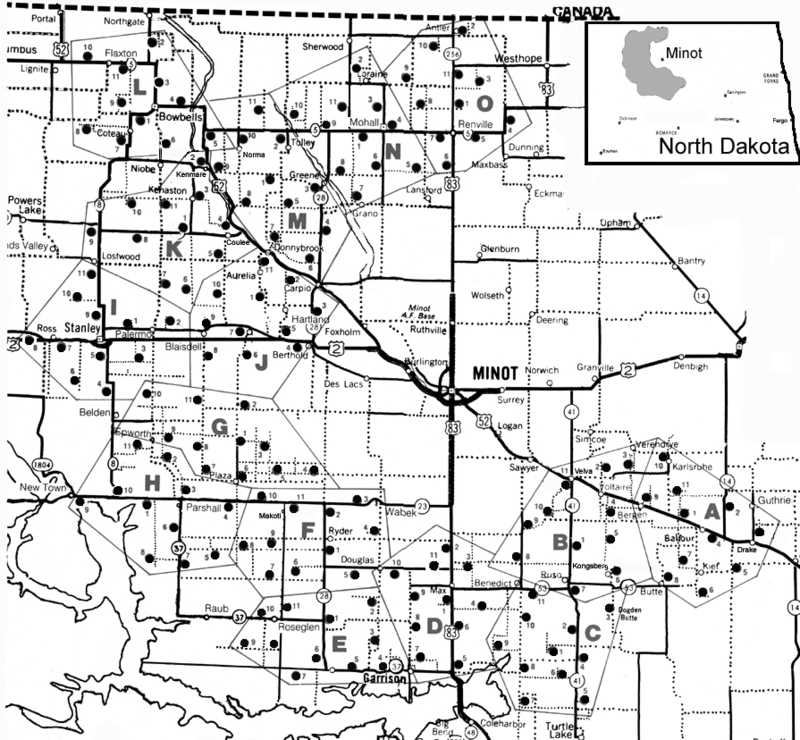 Above are the 150 Intercontinental Ballistic Missiles located in North Dakota. Contact us for related articles and information.